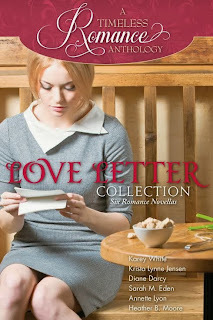 Love Letter Anthology Cover Reveal! And News! 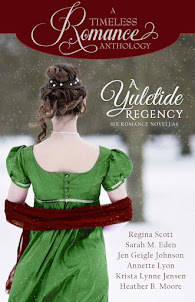 It's downright amazing to think that it's been over a year and a half since Heather, Sarah, and I sat down around my kitchen table to hammer out the concept of creating anthology collections with clean romance stories. We're close to releasing our SIXTH collection, each of which has six stories: three novellas in addition to the three written by us. The others are all by authors we've hand-picked for each theme. That means this collection marks EIGHTEEN guest writers we've worked with and that I've edited, in addition to twelve stories by Heather and Sarah I've edited, and the six I've written for the collection myself. As you can see, this time the theme is Love Letters. But unlike any collection we've done so far, this one will have both historical and contemporary stories. I love the cover, and I'm excited for our readers to get their hands on the whole collection! Note: There are whisperings among the three of us about a possible development regarding the anthologies. Stay tuned! P.S. Be sure to enter the GoodReads giveaway for a hard copy of Lost Without You. Use the link in the sidebar! P.S.2. This week, the Kindle version of At the Water's Edge is on sale for only 99 cents. Sale ends Saturday night, December 21! Today's Word Nerd Wednesday has a more somber topic than I usually take here, but I think it's a relevant one in light of how news is covered in the US and how we interpret evidence presented to us by various sources. This post has been on my mind for almost a year, when I first heard conspiracy theories after the Sandy Hook shooting in December 2012. With the report of the shooting released this week, concluding that Adam Lanza acted alone, and with almost a full year passing since the tragic events of that day, I'm taking a stab at the issue the conspiracy theorists brought up in hope of shedding some light on the situation and, I hope, on not jumping to conclusions in relation to the language used in news reports and other situations. Shortly after the shooting, I listened to several tapes online where people discussed how, in their strong opinions, there had to have been multiple gunmen in Sandy Hook, and that the federal government was hiding that fact. One video went so far as to insist that President Obama himself had ordered the shootings so he could have a leg up in passing new gun control laws. My jaw dropped at that accusation. Obama isn't perfect, and he's made mistakes as President, but would he seriously order the murder of children for a crap-shoot chance for passing a new law? Is he really evil, a mass murderer? Not a chance. Over and over, I came across one piece of so-called "evidence" that these theorists used to "prove" that there was more than one gunman. I won't link to the videos; I don't want to give those people extra attention. The point of this post is to show how relying on language used by victims in the heat of a crisis cannot be psycho-analyzed as a reliable way to justify a personal agenda. They're coming down the hall! They've got more than one gun! Conspiracy theorists based their conclusions, in large part, on the fact that the witness had used the word they while relating ongoing events during the shooting, that a single pronoun somehow proved that more than one person was carrying out the attack. Let's back up the trolley a bit. Almost three years ago, I blogged about how their is gradually becoming a singular pronoun. In English, we simply don't have a gender-neutral third-person, singular pronoun. We have he and we have she, and I suppose we also have it, but we don't use it when referring to people. Often, when we don't know the gender of the person, or when the gender is irrelevant, we have to get creative, and that often means falling to the easiest way to explain with the fewest words. In publications, we often see constructions such as he or she, or sentences rewritten so they have a plural verb and can justify the plural pronoun their. That happens mostly in scholarly publications in academia, student's college papers, and, probably, in any resume you submit. In everyday, casual speech, we often use their as a single pronoun. Why? For several reasons. For one, using he or she gets cumbersome and often sounds hoity-toity. In addition, we tend to go the simplest route when speaking; why use three words when one will do? The English-language culture has shifted. Today, their is largely accepted in conversation as just fine when it's acting as a single pronoun; you won't generally find it in most published works, although that's changing in fiction, especially in dialog, which tends to mirror actual conversation. The reality is, when someone is under duress, and isn't an English professor who is so used to using he or she that the phrase rolls off the tongue without a thought, even in a moment of crisis, a witness will almost certainly use they when referring to an unknown perpetrator. Heightened emotion does that to people: while under stress; we slip into the registers of speaking we're most comfortable in. We're far less likely to adhere to grammatical standards, especially ones we aren't 100% familiar with. 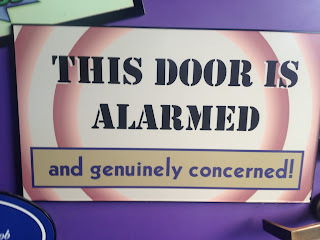 Even if you know the difference between the verbs to lay and to lie and which forms to use when, but you have to think about which form to use even for a split second, chances are, if your life is on the line, you won't give the verb that split second of thought, and a word will pop out, which may well be technically incorrect. In other words, even if witnesses could tell that the shooter was male, we can predict, even without hearing any 9-1-1 tape, that witnesses would describe the shooter's action in terms of they, and not as he. Granted, I doubt the new report will sway die-hard conspiracy theorists, even though they are just as likely to unconsciously throw in they when speaking, even when technically he or she would be correct. I hope that the report of a lone gunman helps give a little bit of closure to the families affected by the horrific events of that day. For the rest of us, I hope that by talking about these things, we gain some clarity. Like how people use casual and "incorrect" words in conversation and especially in life-or-death situations. Like how they're liable to use incorrect grammar or slip into more colloquial usage in tense moments. How we cannot use such speech as a basis for making broad accusations or assumptions, especially when such theories cannot hold water in light of how the language is used in the real world. As much as I hope we never have another shooting or other similar tragedy in this country, I'm not naive enough to think we've seen the end. But I do hope that whenever we hear a tragic news story and people coming up with theories about them, we can take a step back and look at the fact objectively, not over-analyzing a single word and assuming what the person speaking meant by it. Especially, as in this case, when that single word was interpreted so wildly off base. I'm all for unraveling stories to reveal the truth, and language does have the power to do amazing things along those lines. This isn't one of those times. Saying that the use of their automatically means there had have been multiple people committing this crime only causes grief, quite literally, to so many people involved, including the law-enforcement officers who, I believe, really did do their best to find out what happened. 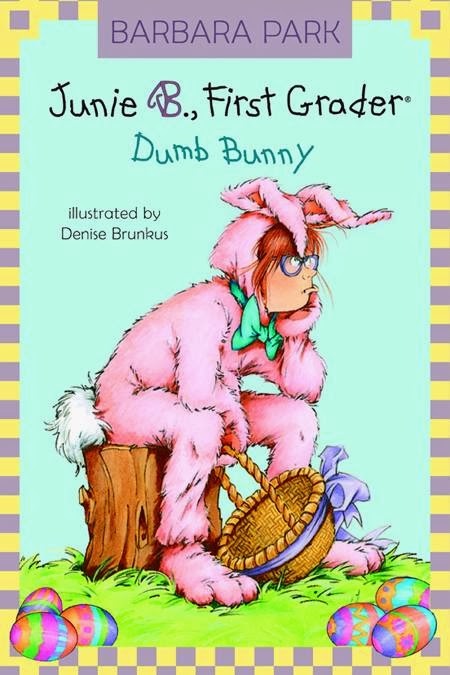 Last week I heard the news that Barbara Park, author of dozens of kids' books and best known for the Junie B. Jones series, had died from ovarian cancer. She was only 66, younger than both of my parents. She lost her battle with the same killer that took my maternal grandmother. Whether you like Junie B. Jones or couldn't stand her improper grammar, the character became a cultural phenom and influenced millions of children, including my own. We have a shelf full of Barbara Park's books, and they are all well read. Even though my kids have outgrown Junie, I have no intention of getting rid of the books. They are a reminder of great times spent with my kids, laughing at Junie B. 's antics, and teaching my kids to read. Recently, my youngest and one of her friends decided to make a Junie B. movie, and they began adapting the book into a screenplay first. I think Barbara Park would be pleased. Park was more than an influential writer, something I bet that most writers would like to be remembered for when they pass. I'll always remember her for something else, as well, something she didn't announce publicly, something you cannot find a news clip about (at least, I couldn't, and I knew exactly what I was looking for). The most public hint you'll get is in the dedication of one of her books. But I'll get to that in a minute. A cousin-in-law's daughter, Makenzie, became very ill back in 2006 with a low-grade brain stem tumor, which threatened to take away her eyesight as well as her life. The extended relatives on that side of the family held group fasts and prayers for this young girl, who loved to read, and, yes, who loved Junie B.
Makenzie's dream was to grow up to become a real-life published novelist someday. We all hoped she'd grow up, but that wasn't a guarantee. In the meantime, enter Make-A-Wish for the next best thing. They arranged for her to meet and spend the day with Barbara Park, her idol. I don't know what all went on that day except that it was a very special time between a special lady and a special little girl. That was November of 2006. Barbara Park didn't broadcast the fact that she'd done this wonderful thing. The only clue anyone had was in the front of her next book, which was released the following February. She dedicated that book to Makenzie in the voice of Junie B. This book is dedicated especially to you from me! I hope it makes you laugh and laugh! P.S. Plus also, thank you to Make-A-Wish for introducing us! Fortunately, seven years after their meeting, Makenzie is still with us, and, last I heard, she is doing well as a teenager, with doctors still monitoring her tumor. With Park's death, I thought the right time had come to let a few other people know about a small thing she did that, to me, shows the kindness she had in her heart and the love she had for children, which is so evident in her books. I find it strangely sad that she died of cancer after a different kind of cancer hit the young girl Park helped to cheer up one day. I hope she has her own angels now, making her wishes come true. Weeks (months?) ago, I pasted a note from Twitter to remind myself to do this post. I'm pretty sure the suggestion came from TJ Bronley, and here I am, finally getting around to answering his request. For this week's Word Nerd Wednesday: What is the difference between acronyms, monograms, and abbreviations? First off, let's look at what an abbreviation is. An abbreviation is simply a shortening of a word or phrase using components of that word or phrase. Some abbreviations use a period at the end, but not all require one. The last two on that list are so common that we've almost forgotten what they stand for (ante meridiem/post meridiem, meaning before and after noon, and Before Christ/Anno Domini, meaning in the year of our Lord). We use abbreviations for all kinds of things, including the United States (the US) and the group of countries that comprise the United Kingdom (the UK). That last one mixes things up a bit, as only the second part (ROM) is pronounced as a word. We still say the letters separately on CD, of course. Initialisms are similar to acronyms. They're also a type of abbreviation. Like acronyms, they use the first letters, but the big difference is that initialisms aren't pronounced as words. Tip: If you don't say it like a word, it's just a regular abbreviation or an initialism, not an acronym. This is a silly name for something that crops up a lot because of how often we use abbreviations. RAS is an abbreviation of Redundant Acronym Syndrome. Say the full name (with syndrome at the end), and we've got a repetitive phrase with RAS Syndrome in action: Redundant Acronym Syndrome Syndrome. Silly, yes, but this kind of thing really does show up all the time. I bet you've heard people talk about a PIN Number, when the N in PIN already means number, so they're saying, Personal Identification Number Number. Or what about a screen's LCD display? We don't need that last word, because then we're saying liquid crystal display display. Monograms are another animal altogether. Unlike the other terms we've talked about, they aren't a type of abbreviation. Instead, monograms are symbols or logos with one or more letters made into a single image. Monograms were often used as symbols of a monarch. Today we see them a lot in corporate and school logos. They aren't words at all, just images that tell the viewer instantly who or what it stands for. An example: For many years during her talk-show period, Oprah used a big O with a specific font to symbolize her name and brand. We still see it prominently on her magazine today. There you have it! If you have suggestions for future Word Nerd Wednesdays, drop me a line on Twitter. 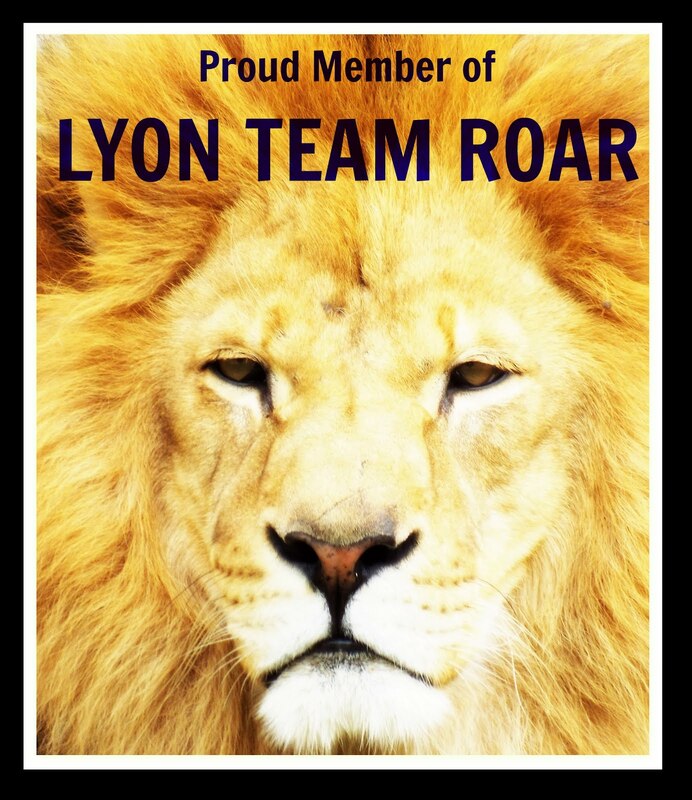 You can find me here: @AnnetteLyon. *I believe InterPol technically has a longer name, but I'm not doing the research on that one today. 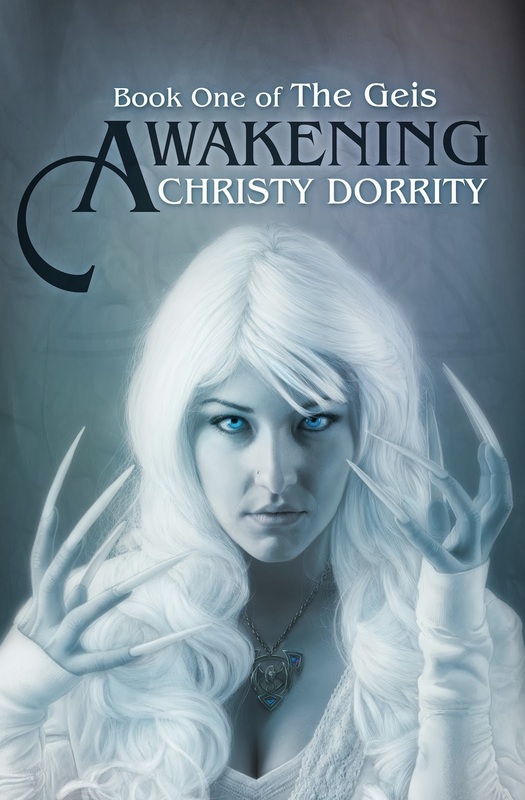 Today I welcome Christy Dorrity to the blog and interview her about her new release, Awakening. I haven't read her book yet, but I'm intrigued; I love mythology, and her cover is awesome! I love what she had to say about crappy first drafts (TRUTH, people! ), and that she enjoys my good friend Robison Wells' work. Enjoy! A thrilling debut novel based in Celtic mythology, Awakening is a gripping young adult fantasy rife with magic, romance, and mystery. CD: Funny, it really was like I got the bug. I was pregnant with my fifth child, five years ago, and all of a sudden, I had this itch inside of me that I couldn't get rid of. I started writing and now, if I go a day without working on writing, I feel unproductive. AL: Where did the idea for Awakening come from? CD: My husband bought us tickets to go see Riverdance, an Irish dance show, and I was fascinated by the music and the rhythms. I began taking lessons and soon became enthralled with the Irish culture and mythology as well. When I began seriously writing, it was natural for me to write about something I felt so much passion for. AL: What research did you have to do for the book? What was the most interesting thing you learned? CD: Much of the research that I did for Awakening had to do with learning about Celtic mythology. I suppose you could count my Irish dance training as research, and that's the best kind of research, in my opinion. I would have to say that the most interesting thing I learned about is the geis—a complicated curse that I drew on for inspiration in this first novel in the series. CD: With Awakening, I wrote by the seat of my pants, and when it came time to edit, my manuscript was a disaster! I have since learned how to structure a story, and I am fully outlining the second book in the series. I'll have to see how it works out. CD: I write in the afternoons when my big kids are at school and my preschooler is napping. It is probably my least productive time of day, but it is the only time I have right now. 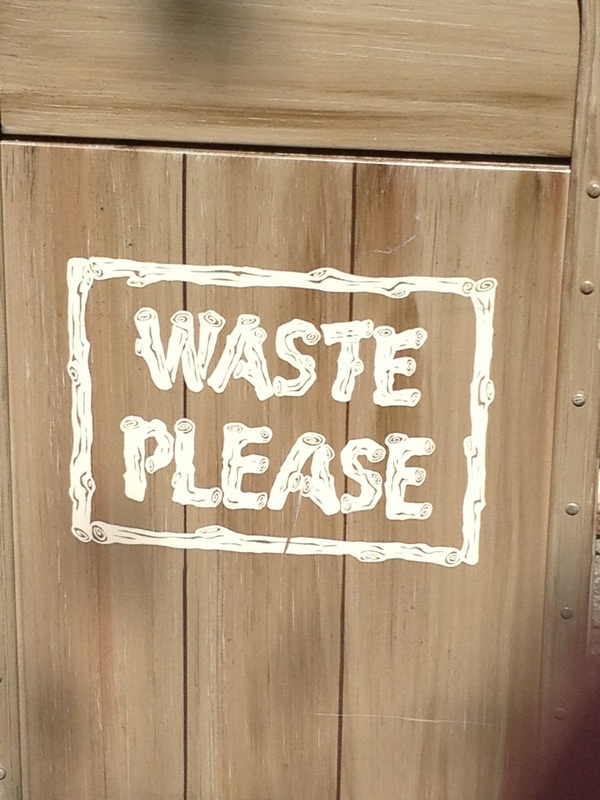 CD: It doesn't matter how crappy my first draft looks—I can go back and fix it. AL: Why did you choose to self-publish? What was that process like? CD: I love the flexibility that comes with self-publishing. I can set my own deadlines, and have creative control over my content. The success of my books lie with me, and no one else. CD: I thought that I would feel somehow different when I released my first novel. That I would feel like I had arrived. But, instead, I'm thinking of the next book and forging ahead. We all know that it's about the journey, and not the destination. CD: I love big, sweeping series, such as Twilight and Hunger Games. But I also love small, character-driven stories about every-day people. Tyger Tyger by Kersten Hamilton, and Descendant by Nichole Giles are a few of the books that I've loved recently that have a similar vein as my novel. Other books I've been loving lately are Open Minds by Susan Kay Quinn, Variant by Robison Wells, and The False Prince by Jennifer Nielsen. CD: I have to say that I was very much influenced by Jack Weyland's books as a young adult. His books were real to me and helped me learn in a way that wasn't preachy or forced. CD: Believe in your book. Write it, put it out there for everyone to see, and be proud of it. If you don't, who will? Christy Dorrity lives in the mountains with her husband, five children, and a cocker spaniel. She grew up on a trout ranch in Star Valley, Wyoming, and is the author of The Geis series for young adults, and The Book Blogger’s Cookbooks. Christy is a champion Irish dancer, and when she’s not reading or writing, she’s probably trying out a new recipe in the kitchen. Find her on Facebook and Twitter. Get Awakening at Amazon or Barnes & Noble. Every three months for a little over a year now, I have a new kind of writing challenge. And by that I don't mean the same challenge every time, but something new, a challenge like I've never had before. You know how, after a big exercise day, you'll wake up the next morning sore in places you didn't know you had muscles? It's sort of like that, but in a totally awesome, cool way. Only I'm exercising writing muscles I didn't know I had. In some cases, it's felt like I didn't even have the muscle at all, and I'm developing it as I go. It began, if memory serves, back in the spring of 2012, when Heather came up with the brilliant idea (she comes up with great ideas quite often) and invited me and Sarah to join her. 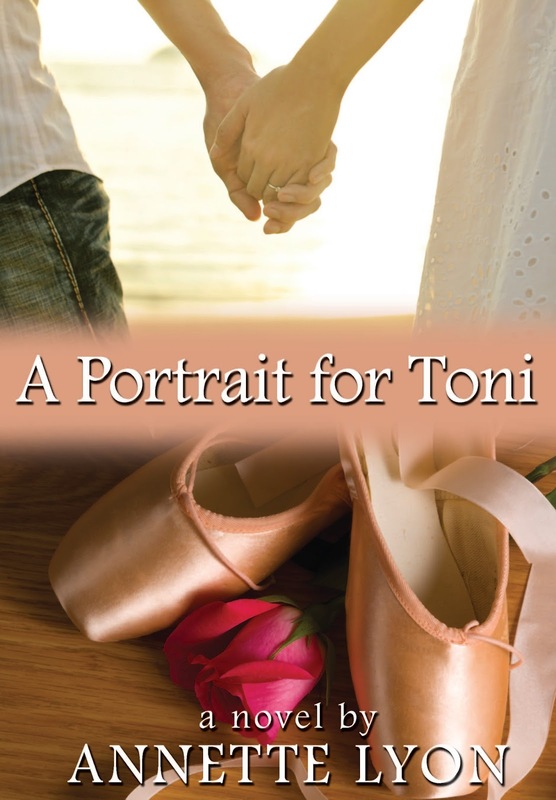 The idea: Write and publish clean romance novellas in anthologies. 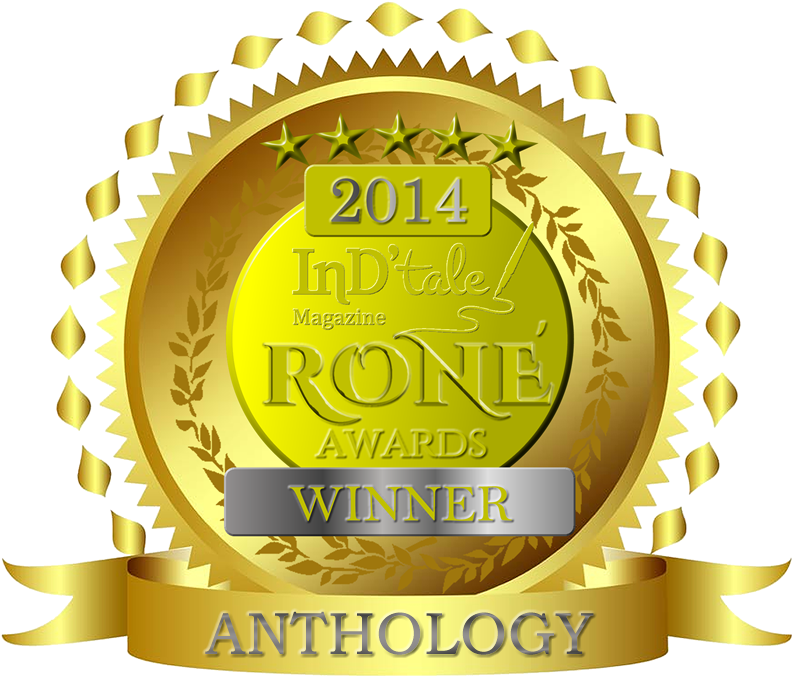 For each anthology, invite three other proven romance writers we know and respect. Everyone involved helps promote the anthologies, which then, in theory helps fans of any given writer involved to get new readers. Plus, how fun is that?! So far we've published four collections under the Timeless Romance Anthologies brand, each with a theme going along with the seasons: Winter Historical, Spring Vacation, Summer Wedding, and Autumn Suspense. One thing that continues to impress me is how differently each writer involved interprets the theme. Every novella is so different from the others, and that's part of what makes the collections so fresh and fun. One big thing we've heard from readers is how glad they are that the novellas are clean. That means there's no content in them beyond a PG rating. More specifically, as for the steamy factor, you'll find nothing steamier than kissing. Heather and I attended the first Romance Novel Convention this summer and came across a writer who thanked us for writing clean romance. She herself wrote erotica, yet she didn't want her teenage daughter reading the kinds of books she wrote. Not yet, at least, not until her daughter hit adulthood and could make an informed choice. 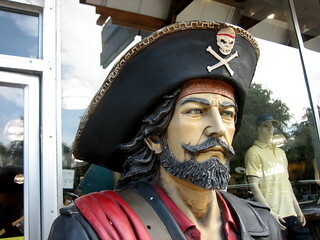 Yet embarking on this journey felt intimidating, to put it mildly. Years ago, I read every short story by L. M. Montgomery (of Anne of Green Gables fame), which were being republished in collections (grouped by the editors into themes—a fun coincidence). I remember thinking that I'd never, ever be able to write something so short, that my story ideas needed a novel-sized chunk to tell. Keep in mind that LMM's "short" stories aren't that short; they're really more like the length of novellas we're using for our anthologies, which run 13,000-15,000 words, roughly 45-50 pages double-spaced in Word. Something like twenty-five years after reading those stories, I'm faced with the prospect of writing not one, but many stories in the space of about 13,000 words, after a decade of writing novels at least 90,000 words long. My longest novel, At the Journey's End ran close to 115,000 words. So, yeah. I needed a big paradigm shift to make this work. The first thing I had to do is boil down how exactly I'd write a novella. Fortunately, I've been writing long enough that I know roughly how long my typical scenes end up being: in the neighborhood of 1500-2,000 words. I figured that gave me roughly six scenes to work with to introduce the characters, setting, and conflict, build to a climax, and resolve the plot, especially with the romantic thread. I also knew that I didn't have room for much of a subplot (something that became an additional challenge with the Suspense collection, which required a subplot to work). I created a very basic outline—a skeleton, really—of the plot for the Winter collection. I remember writing much of that story, which is set in a very snowy, very cold canyon, while on a family trip after spending a day in Island Park, Idaho, in the middle of a very hot summer. We're currently in the middle of production for our fifth anthology, which will feature historical stories set in Europe, and we have our brand-new cover to reveal. I'm trying to stave off a panic attack at the thought of my story leading the collection. That's what readers sampling the anthology will read when they decide whether to buy it. (Eeep!) Part of my nerves may be because this novella has been my hardest one to write so far (which is saying something), although I'm not sure why. I do have a theory, though. Remember the whole exercise/muscle analogy? I don't think it's too far off. Memory fails me when I try to recall who first came up with this next oh-so-fitting analogy: for the three of us involved in every single one of the Timeless Romance Anthology collections, the exercise is not unlike So You Think You Can Dance, where dancers are thrown different styles and genres each week and are expected to excel in them. The ballroom dancer has to suddenly do disco. The ballet dancer is assigned hip hop. The tapper must perform contemporary. Do it, and do it well, or be voted off. In our case, of course, the stakes aren't as high as winning a cash prize and the title on a reality show. But I still consider each challenge something special, and I strive to do my best with every novella. We have a devoted fan base, which grows with each new collection. I want to give every reader a smile and maybe a happy sigh at the end of each story. I give each one everything I've got. That's not to say my knees won't be knocking as this next collection goes live on November 4; they totally will be. WNW: The Outrage over "Literally"
Today's Word Nerd Wednesday tackles a topic that has lit up the Internet in the last week or so: the so-called "news" that the word literally has a new definition, meaning figuratively, which is technically the opposite of what the term means. Note that I put "news" in scare quotes. That's because it's not really news. Dictionaries have been adding that second definition for years. Literally. (Hah!) People noticed this time, because it was a new change to Google's dictionary. I got my copy of the OED about ten years ago, and the alternate definition of literally is there. Granted, that definition is the last of five, meaning that it's the least common and least accepted one. Plus, it has a note that it's "improper" to use literally in a figurative sense. HOWEVER . . . (You knew that was coming, right?) as with every word in the OED, this definition includes quotations from the earliest usages of literally with each definition. And guess what: the quotations for using literally meaning figuratively go way back to Dryden (hardly a hack) in 1687. You'll find quotations from the 1700s, 1800s, and 1900s, as well. In other words, people have been using literally as figuratively for a very long time. So now what? Should we all adopt that definition because it's in just about every dictionary? Not so fast. First let's talk about what dictionaries actually do. Dictionaries don't record what is correct. Dictionaries report what is said and written. They're the non-judgmental messenger. In other words, a word or a definition showing up in a dictionary doesn't give that word/definition any kind of stamp of approval. It may still be considered incorrect according to Standard English. Plenty of words and definitions that aren't Standard English (or at least, not yet) appear in dictionaries, including ain't, which isn't in the ballpark of Standard English. For that matter, if we're stuck on what a word "really" means, let's look at the OED's first two definitions of literally: 1) By the letters 2) In literature. So if we're going by the definition from the late 1500s, my English degree made me literally smart, where literally refers to literature. No one's crying foul that the meaning of the word has drastically changed since then. And that's fine. For that matter, in the OED's entry for literally, today's most common definition ("in a literal sense") isn't listed until number four. 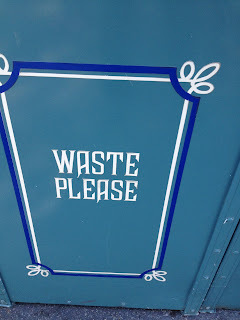 If this sort of thing interests you, here are two other posts that relate, where I've ranted about how English evolves and also how we need to know Standard English to be taken seriously in most educated situations. I used Grammarly to grammar check this post, so I can spend the time I saved eating brownies, because seriously, they won't eat themselves. 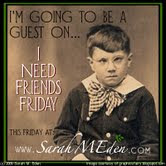 Fans of Sarah M. Eden, Take Note! Big, fun, fabulous news for Sarah M. Eden fans! For the first time, Sarah is having an awesome launch party at The King's English Bookshop in Salt Lake City for her brand-new release, the second book in Shadow Mountain's Proper Romance line: Longing for Home. This isn't a glorified book signing. Oh, no. It's a full-on party. Attendees get a chance to hear Sarah talk to her fans (or possibly do a reading from the book!). Plus they'll be treated to awesome Irish-themed refreshments (fitting because the main character is from Ireland): FIVE flavors of scones (not Utah scones; authentic ones), plus clotted cream and strawberry jam, THREE flavors of tarts, shortbread, mini quiches, and sausage rolls. And of course, you can get your book signed. I mean seriously, people! It's going to be epic! The launch party is TOMORROW, Tuesday, August 20, at 7:00 PM. See full details on the Facebook page. You can pre-order a copy of the book at the bookstore link above, or you can buy one there. It'll be awesome and fun, and I can't wait to see Sarah there to celebrate this big step in her writing career. If you haven't met her, trust me: she's one of the funniest, loveliest, smartest people around, and that's in addition to being incredibly inspirational as she fights for her health in ways I can't imagine and is in chronic, mind-numbing pain. Yet she smiles and laughs and creates beautiful books. And she's a great friend, too. I'm blessed to be able to count myself in that number. So COME! And be on time so you can hear her speak. See you there! The grand-prize winners for the overall hop have already been notified. I've sent two readers e-copies of my grammar book. Now to announce the winners of A Portrait for Toni. We have 2 randomly selected winners. 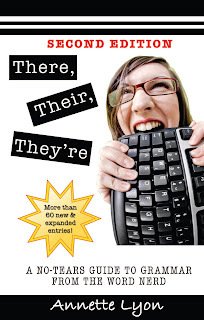 The second is from those who left comments about grammar/punctuation peeves or trip-ups. 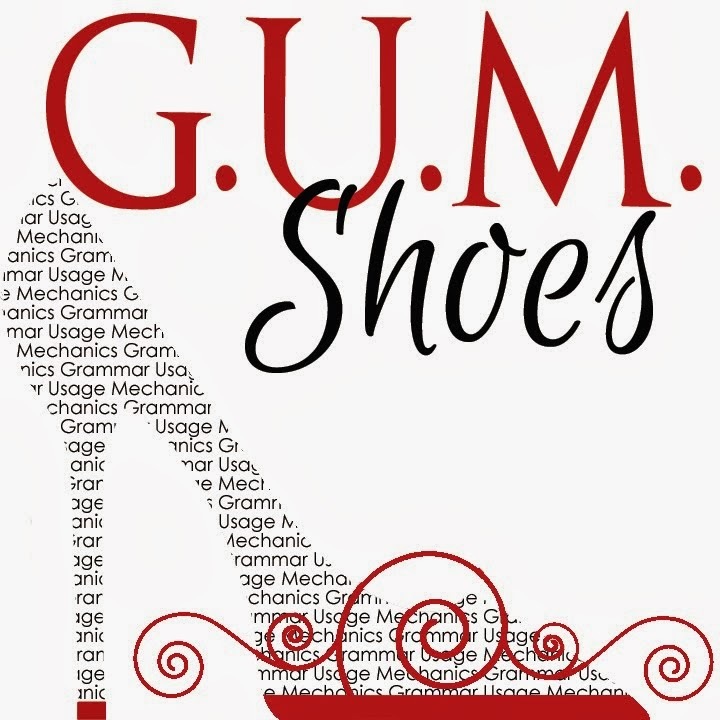 Great comments on a variety of grammar and mechanics issues! I've had a whirlwind of a summer. As vacation time wraps up and school starts for the kids again, I'll be back to blogging more regularly. I have some fun things coming up that I can't wait to tell you all about. Stay tuned! Thanks so much to everyone who participated in the Summer Splash blog hop! Winners from my blog and all the others, including the grand prize winners, will be notified soon! 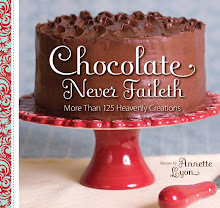 Blog Hop: Win Books & Other Prizes! From Friday, July 26 thru Monday, July 29, I'm part of a giant blog hop extravaganza, where you can hop around from the main Summer Splash Blog Hop site to enter to win a ton of awesome prizes, including e-books, paper books, Kindles, and much more! It begins and ends at midnight on those dates (EDT), so don't miss out. The question: After reading my grammar book, how many points did my son's ACT English score go up the next time he took the test? DO NOT leave the answer in the comments! This post will be on moderation, so if you comment with the answer, your comment will be deleted, and it won't count as an entry. Leave a comment on this post listing a grammar, usage, or punctuation rule that's either a pet peeve of yours or something you always have to check to not mess up. That's it! TWO ways to win a copy of A Portrait for Toni here on my blog, and lots of chances to tweet and otherwise participate in the hop to win lots of other prizes. Some of the blogs have some really fun contests and activities; be sure to check them out! Last winter, our family took a trip to the Happiest Place on Earth. 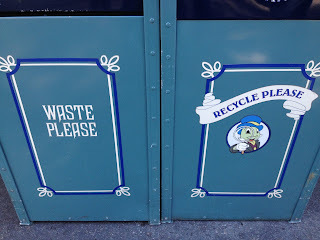 Because I'm a nerd and can't entirely shut off my editor brain even on vacation, I couldn't help but notice a recurring grammatical problem on the trash cans in Disneyland and California Adventure. 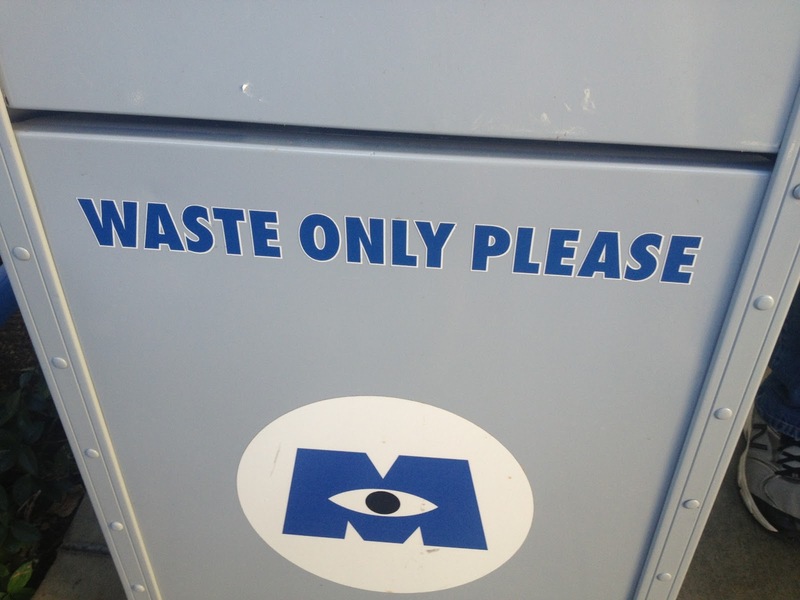 We could argue that they could have added a comma between the two words, making it RECYCLE, PLEASE, but at least the request makes sense. Now obviously they don't want park goers to throw things around and otherwise waste stuff. 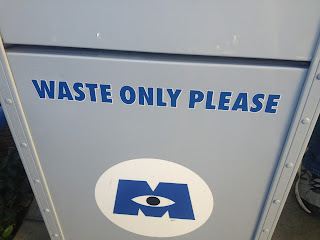 No, what they're asking is for people to put their waste in the can. 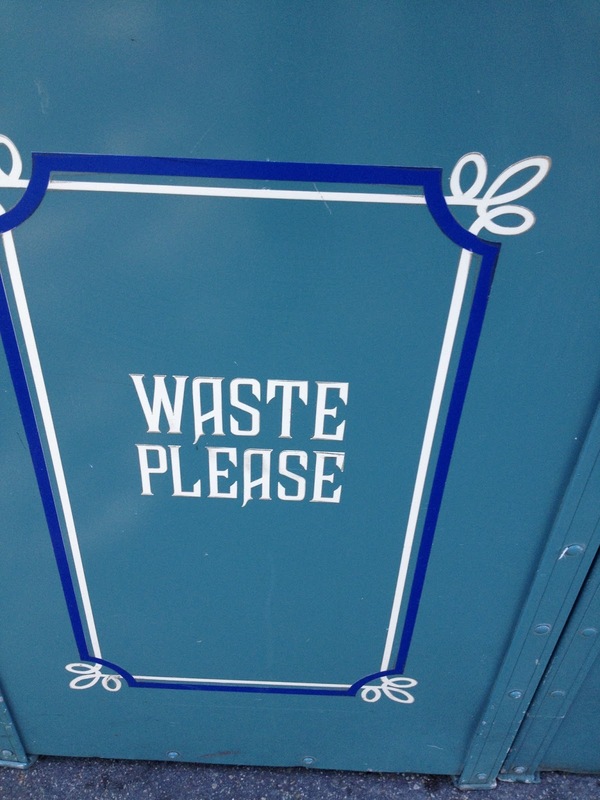 But that's not necessarily what the can says. 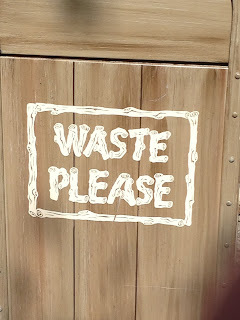 Because waste can be both a verb (don't waste your money) and a noun (garbage = waste), the two-word phrase could mean either, "Please put your waste here," or, "Please do waste the park." 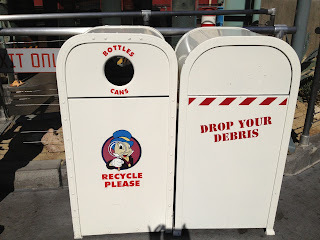 The problem was compounded by the fact that its twin, the RECYCLE PLEASE can, used a verb first, making it all too easy to assume that the other can also has a verb in its almost-matching phrase. 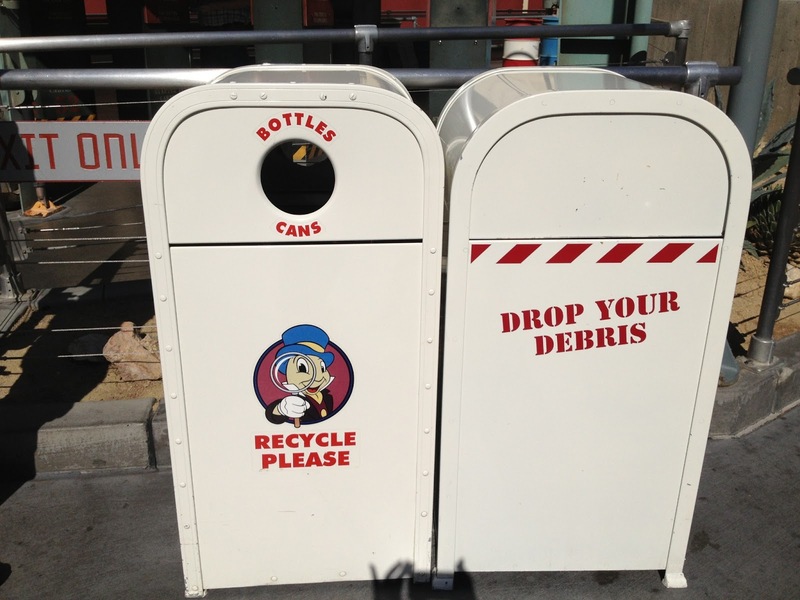 Look at the cans side by side, and you'll see what I mean. 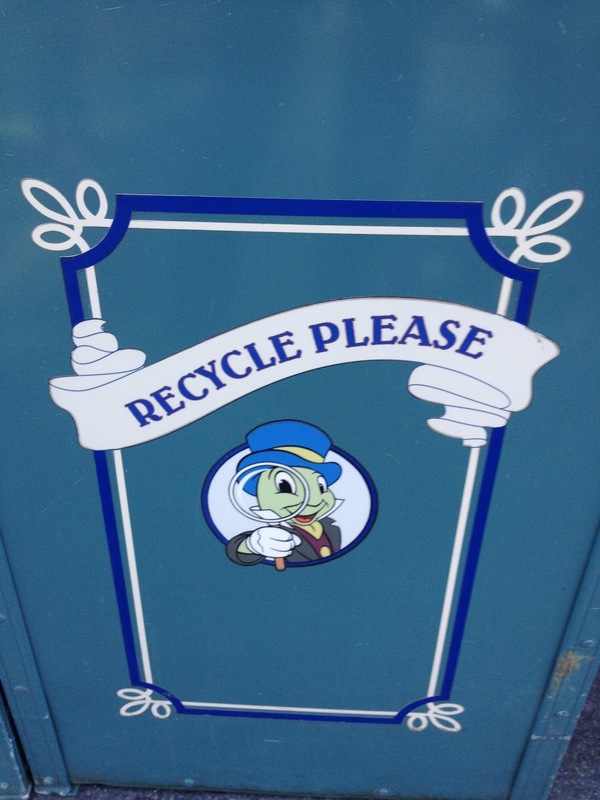 Jiminy Cricket wasn't the only one with the problem. 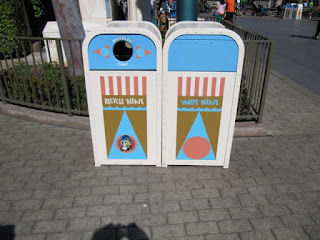 We found the very same issue in Frontier Land. It became a chronic problem everywhere we went day . . .
Monsters, Inc. added only into the mix, but that didn't help; the resulting phrase could have meant "Do nothing but waste," as well as "Put nothing but waste here." Here's a case where they changed up the phrase on one can. They kept the request structure, but here (hooray! 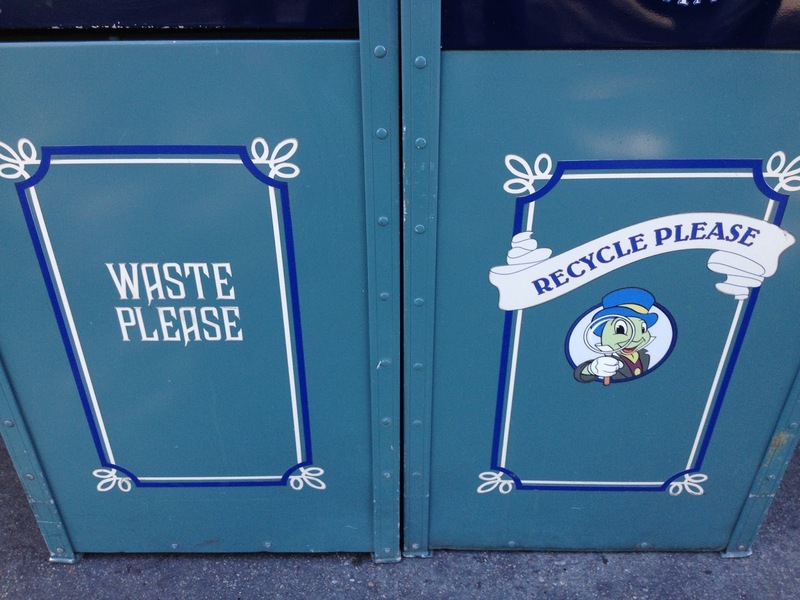 ), the actual request is clear: KEEP IT CLEAN. After seeing so many problems on trash cans, I thought that maybe the problem was solely in the rubbish division. 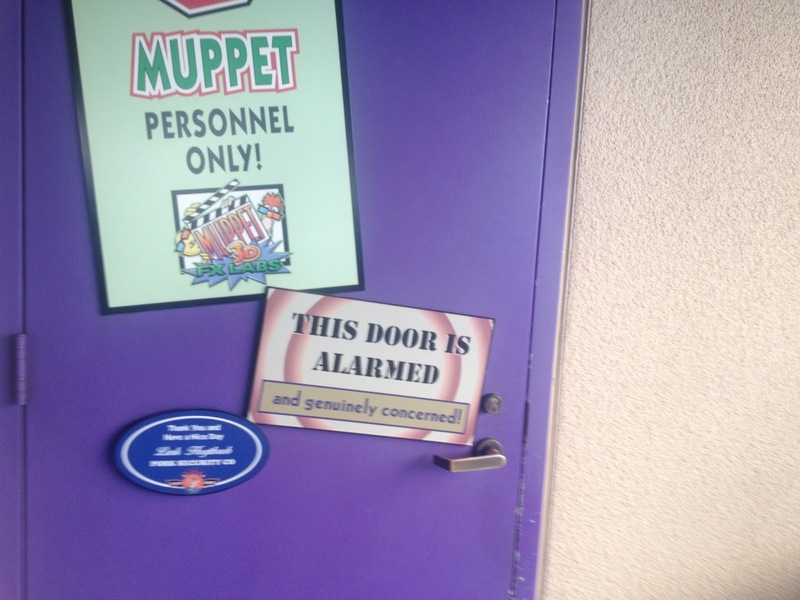 But then I spotted this door at the Muppet theater, and I shook my head, sure someone had messed up again. 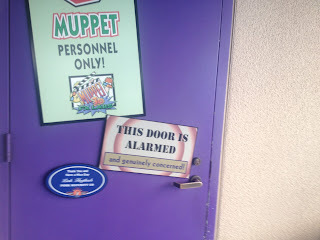 Didn't they know that if something or someone is alarmed, it can mean more than one thing? Oh, yes! Woohoo! 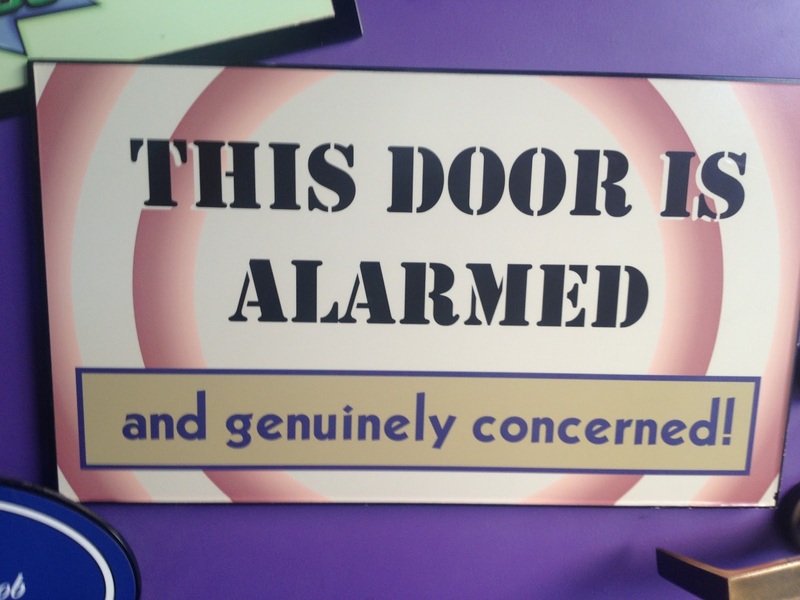 The person who made this sign is smart, knows their grammar, and has a killer sense of humor. After a great trip, we flew home. But as we rode the airport shuttle to the parking lot, it happened again; I laughed at another sign. This one seemed to be an attempt to sound official, but it sounded rather silly. In English, we often create objects by adding ee to the end of a word. For example, I've heard a tutor call the person they teach a tutee. Not a real word, but we know what it means: the recipient of the tutoring. 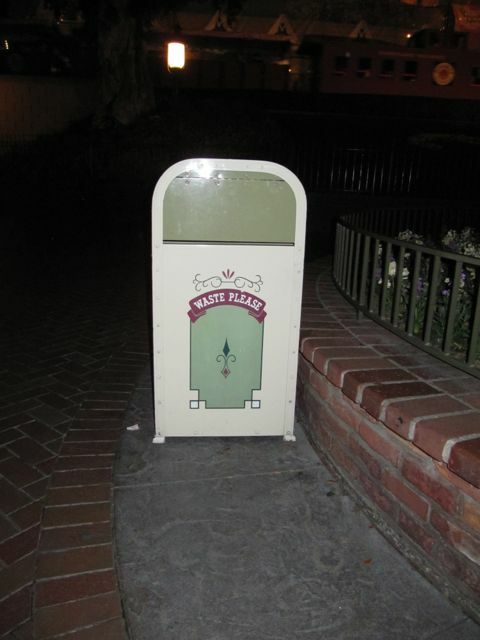 So what in the heck is a standee? As is often the case in public typos, this is probably a case of over thinking it. 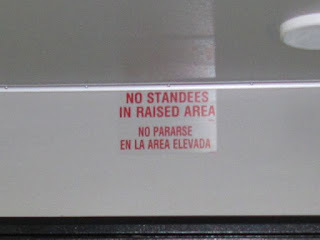 The sign-maker people could have used the exact same number of letters by simply stating: NO STANDING. 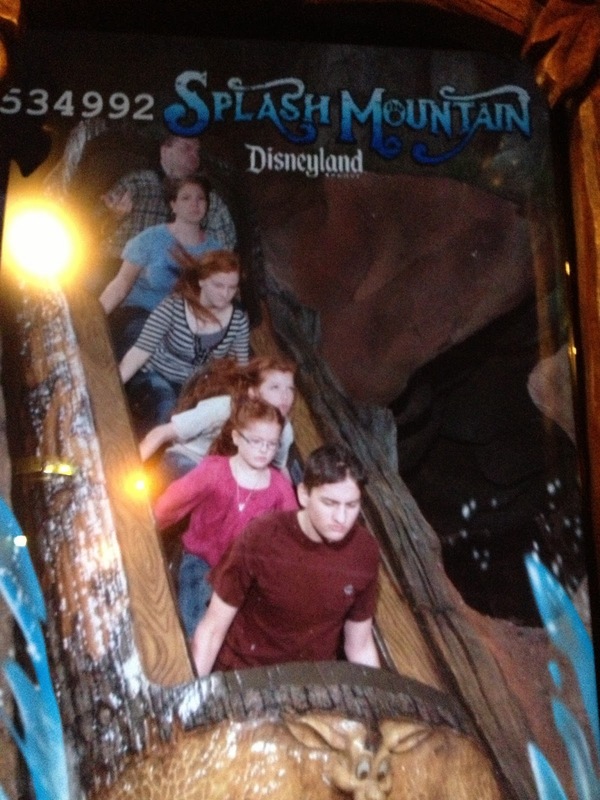 And for the fun of it, as proof that we did Disney, here's a family photo of Splash Mountain, wherein we're inwardly freaking out but purposely looking bored. To catch up, I've blogged about the conference several times: HERE, HERE, HERE, HERE, HERE, HERE, and HERE. For five of those ten years, I've attended the Whitney Awards gala, two as a committee member and three times as a finalist (one of those years, I won—still one of the highlights of my career). I look forward to the conference for many reasons. I enjoy teaching about something I'm passionate about. I love listening to other writers and learning at their feet. I love rubbing shoulders with both aspiring and highly successful writers. It's exciting to see writers grow and progress in their careers. But as I said on Facebook the other day, it's also where, in some ways, I find my people. Because face it: writers are a weird bunch, and only fellow writers really get it. Even when the conference is close to home, I make a point of staying at the hotel, because putting the Mom hat on and taking it off several times a day is not only exhausting for me, but difficult on the kids. They have a much easier time when they know that Mom's leaving on Thursday and coming home Saturday night (or whatever the situation is). 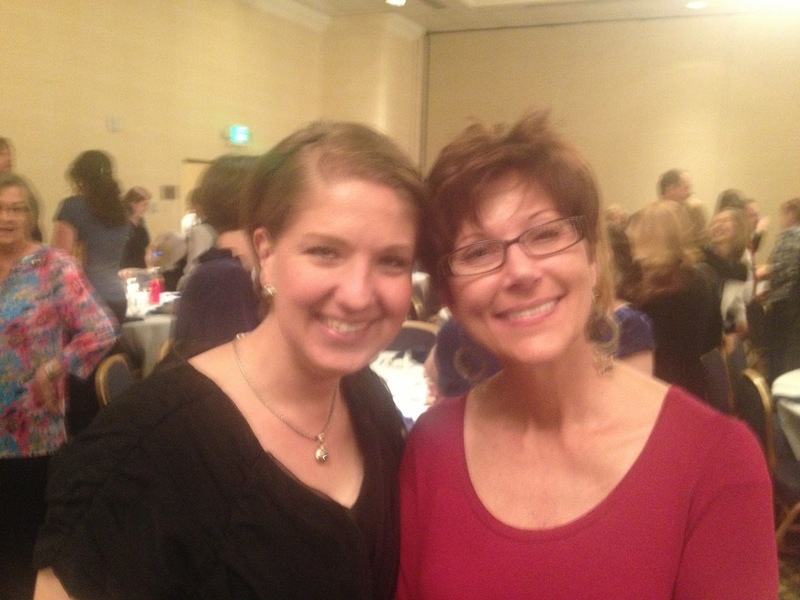 This year I shared a room with Heather B. Moore and Sarah M. Eden. As fun as the conference is, it's also exhausting. One night we all lay in bed in the dark, staring at the ceiling in silence. We were all wiped. That's when Sarah said, "This is the lamest slumber party ever." And it was, but we were happy about it! This year was particularly awesome for several reasons. Left to right: J. Scott Savage, Michele Paige Holmes, Annette Lyon, Sarah M. .Eden, Heather B. Moore. Another was hanging out with my dear friend and accountability partner, Luisa. (How did we not get a picture together?) She lives far away, so although we keep in almost daily contact, we don't see each other very often. Even at conferences, it's often waves in the hall with promises to find a time to connect. And then we never do. This year we found time in advance and penciled it in, and it happened! The Whitney gala was a delight. Having an excuse to dress up is always fun. Seeing friends and colleagues is great too. And even though I didn't win (and was quite sure I wouldn't; Paige was up against some awesome books), I had a great time. 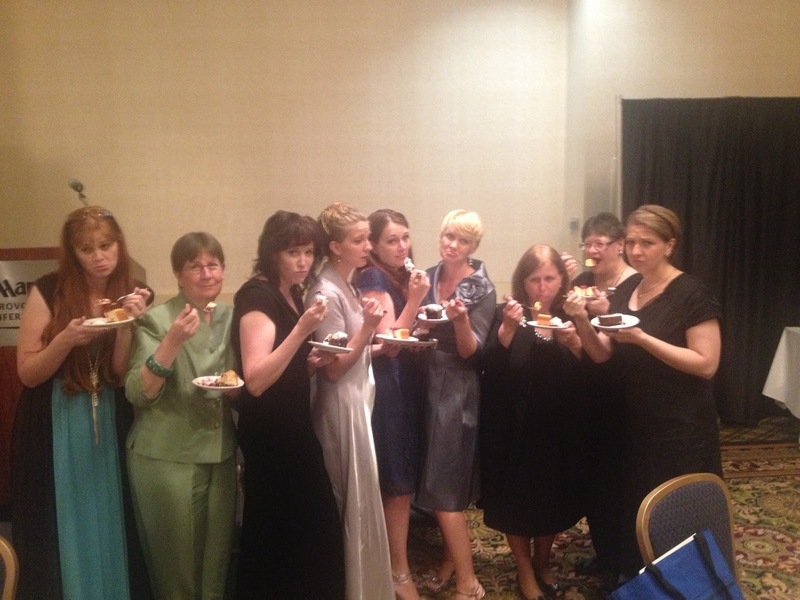 This year I was part of the losers cheesecake pictures, which Janette Rallison invented. I even got to meet Ka Hancock, whose book I fell in love with. Can't wait to read what she publishes next! But the highest point of the whole weekend was our keynote speaker, Anne Perry. Friday evening she gave her keynote address, and Saturday morning she taught a 2-hour master class (which I luckily signed up for before it filled up). Her keynote address was nothing short of inspired. I could have listened to her all night (and not just because of her lyrical voice and British accent). Her words touched my heart in a sacred place, in a way no one else has ever done. Anne Perry is a fellow Latter-day Saint and a master writer, and she drew on both of those things in her address. I was near tears the entire time. It's an experience I'll never forget. She changed me. At one point on Friday, I saw her eating a meal alone at a table. I knew her seatmates would arrive shortly; she was at a table reserved for them. I wanted to go up and say hello, to tell her how I admired her as a person, how I love her work and her voice, and how reading her books has inspired me to raise the bar on my own work. On one hand, I told myself that she's human, and that she would welcome a friendly hello. On the other, a voice screamed in my head that She's Anne Perry! You can't do that! So I chickened out. I regret that now and probably always will. I doubt she'll ever read this, and I may never have another opportunity to tell her what her work and her words this year mean to me, but I'll never forget this conference or the influence she had on me and hundreds of others. WNW: An Excellent Issue. Single & Double Plurals. Oprah and her best friend, Gayle, had gone on a road trip across the United States, and camera crews followed them. The result was several episodes of something they called "Oprah and Gayle's Road Trip." A viewer wrote in saying that the title was incorrect; Oprah's name also needed a possessive, like so: "Oprah's and Gayle's Road Trip." She ended her note by saying she was an English teacher and therefore knew this stuff. The viewer was brought on to tell her side, and then Oprah brought on Mignon to reveal the truth. Did the show get it right or wrong? The show, not surprisingly, got it right. I doubt Oprah would have embarrassed her staff by bringing on a grammar expert to publicly point out a mistake. But why was the title correct? Is there a time where making both names possessive would be correct? First, yes, there are times when making both names possessive is correct. And there are times when it's not. It all depends on whether the ownership is joint or separate. Jane and Sally’s bikes are in the garage. Jane’s and Sally’s bikes are in the garage. Which you choose depends on context. We need more information about the bikes before we can make the call. But if Jane and Sally simply own different bikes (Jane’s is purple, and Sally’s is blue), we’re dealing with separate possession, so each girl needs her own apostrophe to show her ownership of her bike. Tom and Joey’s parents go on dates every weekend. But what if Tom and Joey are buddies rather than brothers? What if both sets of their parents happen to be friends who hang out in a larger group together on weekends? Then the whole situation changes. Now we’re talking about Tom’s parents, and we’re also talking about Joey’s parents: four different people, not two. Now we need to make both boys' names possessive. Tom’s and Joey’s parents go to the movies every weekend. Tom and Joey’s political views sparked controversy. Tom’s and Joey’s political arguments sparked controversy at school. Or you can always remember the Oprah viewer who was wrong. Oprah and Gayle took their trip together. It was their joint trip. Therefore, the title of those episodes needed only one apostrophe. If they’d gone on separate trips, we’d need two. If you're from my generation, you can just think of a favorite movie to get this one right. Bill and Ted had a shared adventure. Therefore, their movie is Bill and Ted's Excellent Adventure. This topic and many more are new to the second edition of my grammar book. It's got more than double the word count of the original, with tons of new entries and many expanded ones to address more commonly asked questions I get. We're putting the final touches on it now. Watch for it in May! Three announcements today, all of which I'm excited about! First off, this Saturday (April 6) I will be signing books for the first time in six months. 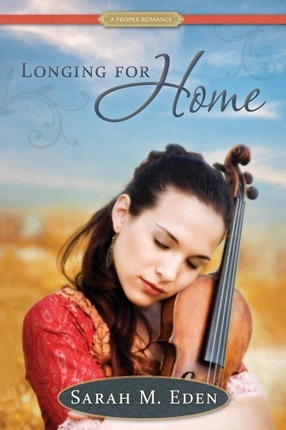 I'll be at the University Village Deseret Book in Orem during Ladies Night from 6 to 8 PM, signing copies of Coming Home. Signing with me is good friend and awesome novelist Sarah M. Eden. Please come! 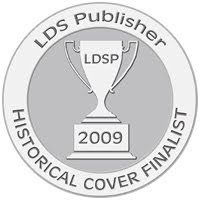 Second, yesterday I was notified that I won Utah's Best of State medal for 2013 in Literary Arts for Fiction. I'm thrilled! Long-time readers will recognize the award, because I received it way back in 2007. To get it again, after writing totally different works, means a lot to me. And finally, my expansion and major update to my grammar book is almost done! It'll be up for sale in both electronic and hard copy in time for the LDStorymakers conference, which is the first week of May. The word count is more than twice the original, with dozens of brand new entries and lots of expanded ones. The comma section alone is much longer, something readers have been asking for. So: In celebration of being a month out from its release (and hey, to celebrate my award! ), here's the brand new cover for the 2nd edition of There, Their, They're: A No-Tears Guide to Grammar from the Word Nerd! Publishing this post scares me, because the subject is so personal. I'm going ahead with it anyway with the hope that I can get across my meaning. Deep breath. From my first attempt at writing in second grade, I began my journey making up fantasy stories. 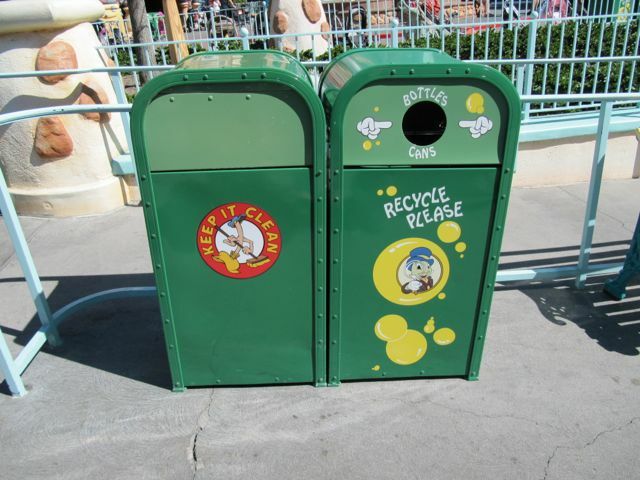 Many long-time readers will know that those early plots were largely inspired by Beverly Cleary and her mouse Ralph, resulting in several stories involving rodents. Even in high school, when I co-wrote an entire novel with a friend, it was a re-telling of a fairy tale (this was waaaay before doing that was cool or commonplace). The first novel I tried my hand at by myself as an adult: also a fantasy. So it came as a surprise to me when I began getting ideas for books with a specifically Mormon angle to them. Of course, those ideas turned into the books that got published. I did two contemporary novels that you could call romance, and I generally do, but I've never been entirely happy with that label. 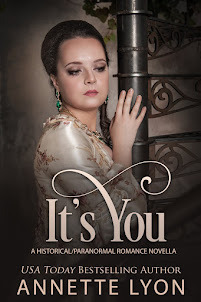 Not because I don't like romance; I absolutely do, as evidenced by THIS and THIS and the fact that we're doing more of Timeless Romance Anthologies and having a ball with it. Not to mention that I went on to do historical LDS novels, and every single one of them has a romantic element. But those first two books especially had something else in them too, something I couldn't put my finger on, but which made me hesitant to classify them strictly as romances. So there was Lost Without You, and then At the Water's Edge (although they were written in the opposite order). Then came the four historicals: House on the Hill, At the Journey's End, Spires of Stone, and Tower of Strength. 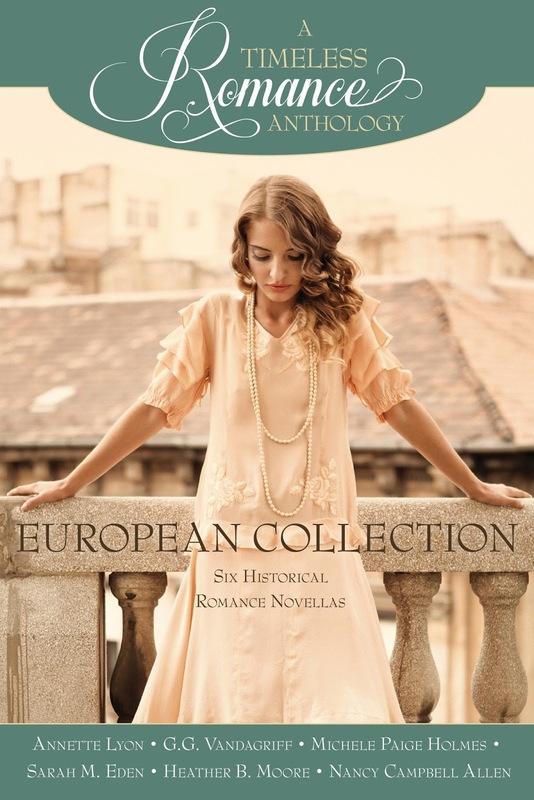 Each of my historicals, with the exception of Spires, which is a romantic comedy in spite of the serious-looking cover, had that same "other" quality. Then I was told not to write any more historicals. And I wondered what in the world I'd do next. I'd already started researching my next one, and I had to set it aside and find something else to write about. Enter my childhood friend Chris and her husband's deployment, which in a roundabout way led to me deciding that I had to write about what it's like to be home with a soldier gone and in the line of fire. In categorizing that book, romance never entered my mind, because, well, it's totally not. Band of Sisters is clearly women's fiction. Some people think romance and women's fiction are the same thing, but they're not. Not even remotely. Women's fiction doesn't have a love story as the primary arc, and it deals with issues and conflicts that wouldn't normally appear in a romance. I loved writing that book, and it even took the Whitney Award in its category that year. Then I had a good chunk of my critique group also writing youth fiction, and this one and this one have had significant success with it (young adult and middle grade, respectively) on the national stage. Yet I also loved mysteries, and I had a bunch of cool ideas for some. I loved romance, and could see myself writing that. I loved historicals, and would be happy doing more. And so on. What on earth should I focus on?! My publisher couldn't/wouldn't give me direction on what they wanted next besides no more historicals even after I handed over a list of ideas and asked which they'd be most interested in. I floundered like a boat without a rudder. I had a total and utter writer identity crisis that lasted two and a half miserable years. The go-to advice for this kind of situation is to write the kind of book you like to read. Problem: I read all kinds of books, and I enjoy just about every genre. So that suggestion was no help. Yet I knew I needed a clear path, something to sink my teeth into and identify as my own. I needed a map to plan my writing future. I ended up deciding to write the sequel to Band of Sisters even though I had no assurance that my publisher would take it. They did (yay! ), and Coming Home was released in January. During the last year or so, a few things happened to cement my writer identity. One was researching and writing Coming Home. 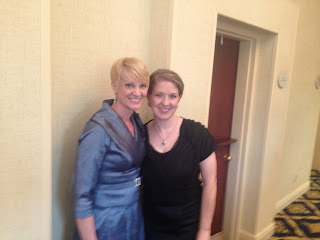 Another was being part of The Newport Ladies Book Club series with my novel Paige and the forthcoming Ilana. And then during the 2012 LTUE conference, Luisa and I went out to dinner to brainstorm. She knew of my identity crisis and suggested we hash it out over food. I brought along a notebook with ideas that included young adult fantasy, historical, romance, and everything in between. We picked a story with a really cool premise, and by the time we paid our tabs, we had a rough plot sketched out. In writing that book, which I'll begin major revisions on soon, I finally came to realize that this was the genre I belonged in. It was women's fiction. And women's fiction is my home. I realized that my first two books were women's fiction in disguise. That was the element I could never quite wrap up tidily in the romance bow. Women's issues popped up in my historicals too. While I was thrilled to finally latch on to my writer identity, it came with a price. 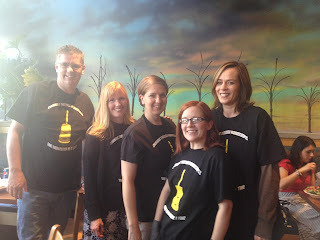 Remember, I live in the land where writers of youth fiction are rock stars and are most respected by colleagues. Even my own daughter recently asked if I could please write a cool book like the fantasy we were reading together, and it broke my heart to say that I'm writing for grown-ups. Then there are those packed, celebrity-style launch parties like the one I linked to above. It seems that most writer events for fans tends to lean more toward youth fiction as well. There was one a few years ago that included my friend Janette Rallison (who writes YA), and at the same event was Scott Westerfeld and Stephenie Meyer, among others. Really. I've had to come to terms with the side of my ego that would like acclaim. The reality is that if I become very successful with women's fiction, it will be with limitations. In some ways, I'd like my youngest to look at me like her hero, but that can't happen if I'm not writing kids' fantasy books. Which I'm not. While I'm not greedy, I am a professional, and I do rely on the money I make through my writing. Making a conscious choice to essentially limit my potential income was hard. I also had to choose to basically walk away from earning the respect of certain peers who almost look at youth fiction as the one and only true market. Would I like my ego to be stroked a bit? Sure. Could I write youth fiction? Sure. I love the genre, and I've developed the chops over the gazillion years I've been writing to do it. But when push comes to shove, I believe that I'm supposed to be writing women's fiction now. When I look at my list of story and research ideas, it's all women's fiction now. I've wondered why, and why now. Why didn't I figure this out 18 years ago when I first started submitting? There may be several reasons, but I think a major one is the fact that while youth fiction isn't any easier to write than grown-up fiction (they're both hard to do well, and anyone who tells you differently is lying), in order to write good women's fiction, I simply had to be older. I had to experience more, see more of the world, encounter more situations, gain more maturity. On the other side, I've already been an adolescent. As long as I can write well and tap into that part of my brain, I could write youth fiction. But I couldn't have written good women's fiction at 21, because back then I was barely a woman. A bit of irony: Turns out that the old piece of advice was right after all. While I do read all kinds of books and love almost all genres, if I had to list my top books of all time, most of them are, yep, women's fiction. On our last Word Nerd Wednesday, we talked about how Utahns say mountain and how some people over overboard in trying to be "right" (note the sneer quotes) by pronouncing the T. When my friend Jordan McCollum, who is as big a word nerd as I am (only more qualified, because she's got a degree in linguistics), commented in that post about hypercorrection, I knew I wanted her to elaborate on the topic and share it with my readers. Don't know what hypercorrection is? Don't think you're guilty of it? Maybe, maybe not. It's worth knowing about. Read on! Have you ever drifted out of your lane while driving? I know I have. The natural tendency is to quickly correct your course by pulling the wheel back the opposite way. 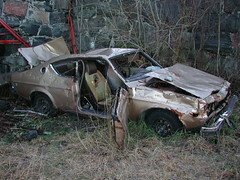 But sometimes, a drifting driver jerks the wheel back in the right direction too much. The over-correction succeeds, but the vehicle shoots into the wrong lane or the car rolls. The same thing happens in language. (Okay, with fewer fatalities.) Most people want to speak "correctly." But did you know there might be such a thing as "too right"? I'm sure we've all had an English teacher or other "friend" who corrects casual speech with prescriptivist usage and pronunciation. Hypercorrection is the linguistic term for being "too right." Usually, hypercorrection comes about because the speaker knows the "rules" of the language, in pronunciation, usage, or grammar, but applies them in more situations than they should (hence clip at right). Hypercorrection is a very common phenomenon. In fact, it's part of learning a language, too. If you've ever heard a small child suddenly start saying "goed" instead of "went," it's a form of hypercorrection. They're learning that you form the past tense by adding the -ed sound, and applying it in situations where you actually don't follow that rule. A couple weeks ago, Annette blogged about how people pronounce "mountain." People see the T and believe that they pronounce it like you'd say a T in isolation, or at the beginning of a word. However, the American pronunciation of "mountain" uses a glottal stop instead of a "tuh" (and those are just two of the six ways T is pronounced in English words!). However, some American English speakers see the "T" and think the "correct" pronunciation must feature a hard "tuh" sound like you'd hear from a T at the beginning of a word (or in British English). But T is virtually never pronounced as "tuh" in the middle of a word in American English—we rely on four of the other "allophones" of T in the middle of words, and the glottal stop is just as valid a rendition of T as the "tuh." So when you stick a "tuh" in the middle of "important," you start to sound a little . . . well, self-importuhant. Phonologically speaking, this pronunciation is unnatural in all varieties of English (because in British English there's no 'r' there). The "hever" is exactly the same principle—applying a correct rule (add an 'h' to the beginning of words that you pronounce as starting with a vowel) to an incorrect situation (a word that really does start with a vowel). Funnily enough, this same principle has changed the pronunciation of the name of the letter "h" in some varieties of English to "haitch." This is also influenced by the perception of h-dropping accents like Cockney as lower in prestige. The same principle applies to grammar (maybe even more so). For example, most speakers of English are taught from a young age that you shouldn't say "me" in subject position: Never "me and you went to the store." (Don't you just cringe?!) Always "You and I gave her the gift." But when we move the "me" into another position in a sentence, things get a little trickier: "She gave the gift back to you and I." For our one year anniversary, my girlfriend caused myself to go to a Yankees game, with whomever amongst our friends can go. But, the Weather Channel just changed their forecast and the skies are grey, so we might go with the girl that lives next door to see the movie, "Iron Man 2". We all want to talk correctly. But keep in mind that hypercorrection isn't "extra right." It's actually wrong. What do you think? What are your favorite examples of hypercorrection? How do you see good grammar principles go bad? 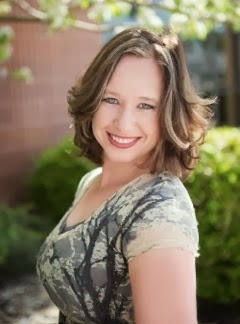 An award-winning author, Jordan McCollum blogs about writing craft and the writing life at JordanMcCollum.com. She holds a degree in American Studies and Linguistics from Brigham Young University and now makes her home in Utah with her husband and three children. 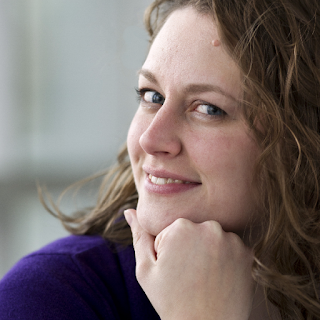 Catch up with her writing links, word nerdiness and crazy life on Twitter, @JordanMcCollum.